﻿ richard scarry’s best storybook ever. 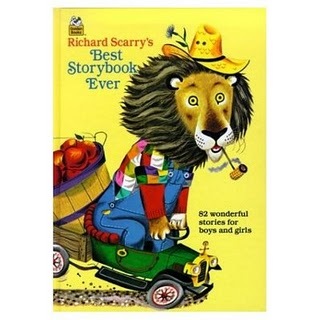 richard scarry’s best storybook ever. Richard Scarry’s Best Storybook Ever. My mom saved my tattered copy and sent it to me last year. Now it’s one of my son’s favorites. It’s filled with short stories and little vignettes where silly animals depict human life in silly ways. From colors to ABCs to animals to cities, learning takes place on every page. Ideal for vocabulary development and also story time, as the stories are brief, fun, and delightfully illustrated. Pierre Bear, and any page with with diggers, trains or trucks, rates tops with my little one. Luckily it’s still in print. Makes a great addition to your family library or a wonderful, ageless gift for little ones in your life. I think this book is the reason I learned to read very early. It’s my favorite too! Oh Richard Scarry, I heart you. Oh…I loved that book. You could see how EVERYTHING was done…from plumbing to making paper. It was my “encyclopedia”. All the Richard Scarry books are good, but this is one of the best. My kids now have my old dog-eared version too. Looking through it I’m amazed at how many details I remembered. A must for every library. We inherited all my husbands old Richard Scarry books and they are some of my daughters favorites. Now if I could only get my Mom to give me my old Scarry town play set! Holly: oh my goodness, there was a play set?! We love this book at our house too! Our copy is duct taped on the binding but still in use most every night. Great for picture readers since there are SO many things happening on each page. The. Best. Book. Ever! We read this to our 4 daughters when they were growing up, then found copies of it for them as adults for their children to read as well.